How appropriate that this post should be my 100th. I knew it was coming up, but hadn’t actually planned to have it coincide with this recipe. Maybe it’s Dot smiling down on me? I like to think so. I miss her right about now. This was my grandmother’s signature recipe. Her calling card, if you will. She was famous around town for her Christmas cookies. They were a coveted gift, a much fought over Grandparent’s booth item at the annual Christmas Fair, and a holiday staple around our house. 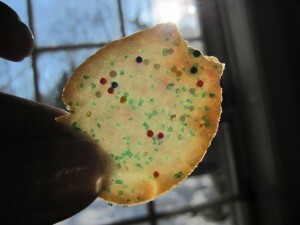 She’d start the day after Thanksgiving, turning her kitchen and laundry room into a virtual cookie workshop. Tins would line the shelves, stacked for what seemed, to a 10 year old, like miles. There were all different shapes and sizes. Bells, trees, holly leaves, Santa’s boots, stars, snowmen and wreathes. The latter two she actually hand painted. She had a rather zany sense of humor…there was always a snowman smoking a cigar or wearing a cowboy hat. We’d have to find them in the bunch. My little brother always liked the snowmen (he made a habit of eating the head first). My uncle and I liked the bells. As Unc would say, they were the most cookie for the money. 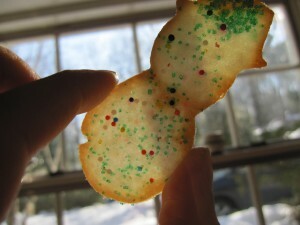 These cookies are insanely delicate. You can literally see the light through them. They’re actually incredibly beautiful. The painted ones look like stained glass. Beware of dropping the tins. They break easily. Though Dot’s been gone for five years now, Mom still keeps the tradition alive. While Dot made 100 dozen (I told you- cookie workshop), Mom usually makes about 5 dozen, which, considering how fragile they are, is still a Herculean feat in my opinion. They come out on Christmas morning and again at dinner, and we remember with love the complicated woman for whom this blog is named. I wished that everyone could feel as lucky as I do. I wished for twinkle lights and stars. I wished for singing, and laughter, and gifts that actually mean something. I wished for full bellies and fuller hearts, and families who embrace each other and cherish their togetherness, despite differences. I wished that 2010 bring healthy family members, healthy babies, and healthy outlooks. Most of all, I wished with all my heart that all of my loved ones realize how special and blessed they are. I extend these wishes to you, my friends. Merry Christmas. Combine all ingredients in a food processor until a ball forms. Knead briefly to make sure everything is incorporated. Chill overnight. Bring to almost room temp and roll out on a floured surface. You want them as thin as possible. 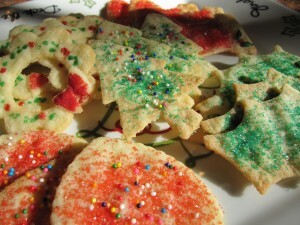 Cut into shapes with cookie cutters, sprinkle with colored sugar, and bake in a 350 oven for about 5-7 minutes.